When looking at architectural history it is important to consider building types in addition to architectural styles. One such building that might not carry much architectural merit is the roadside storage unit. This lowly structure is practically in every town, hamlet, and crossroads throughout Mississippi (and the rest of the country). I had not given much thought to these building types before, let alone their provenance. But after reading the article below in a 1975 Delta Democrat Times, my interest had been piqued, and I figured the article was worth sharing. Mini-warehouses, which provide small spaces for personal or light commercial storage, are making their debut in Greenville. Self-Service Storage, Inc. is finishing construction of its first building at 1103 Lewis St., designed to contain 20 storage units, and has begun building an additional 40 units. Jim McCoy, president of Self-Service Storage, said that each unit has either a steel man-door or a roll-up overhead door, and sizes vary from 8×20 feet to 12×20. There are some units under construction which will be as large as 15×30. The units offer the apartment dweller, the small businessman or the homeowner with a crowded garage a place to store property and have access to it any time during day and early evening, McCoy said. The units rent by the month, with a slightly lower rate obtained for renting by th year. “We think this will be a welcome addition to a growing Greenville.” McCoy said. This storage unit building is still standing at 1103 Lewis Street. Doesn’t look like it has changed much since this article was published in 1975. The first of the two buildings does indeed look to have twenty units with nine on both the north and south elevations, with presumably, two units on the west elevation. It looks like a small office is accessed from the east side. The second building that was alluded to in the article was constructed, though it appears to only have fourteen units, far short of the speculated forty additional units mentioned in the article. The introduction of the mini-warehouse appears in Mississippi about 1974. Does anyone remember a building of a similar type that was around before this self-service storage? It’s hard to imagine, but this structure could be eligible for the National Register of Historic Places in a mere 6 years. And like Santa Claus, they’re everywhere! They’re everywhere! I’m guessing you will do a follow-up of particular styles in an area with their faux fronts? I imagine that says something about socioeconomics of an area. Ha-Ha! I don’t know about a follow-up, but you never know. It certainly seems like this building type followed the same trajectory as service stations. Starting off as pretty rudimentary, and ending up sophisticated buildings. Now some are climate controlled, with all sorts of amenities. One I was in a few years back actually piped in music. I’m not sure why, but it certainly created an atmosphere in an otherwise big empty building. Piped-in music to help calm the nerves of the stored items, maybe? I think It might have had something to do with keeping rodents at bay, although I’m not sure how well that works. But isn’t the story that the rodents follow the piper? What I hear you saying is, I’m going to have to start watching Storage Wars with a more critical eye for the buildings and not for the junk they’re pulling out of the storage units? The units sadly evidence a consumerist society that mindlessly buys junk. Sad-looking architecture for sad impulses. However, this, as usual, is a wonderful post. Thanks! You’re welcome. Gald you enjoyed it. Thank you for the poignant comment. McMansion Hell has a great post about moving and household goods, ca. 1900, that really reflects just how much stuff we as a society now accumulate. Climate controlled storage units were around in the late 1970s. The belongings of one of my great-grandmothers were stored in a climate controlled unit in around 1980, since there was not time then to divide everything up. What my grandparents found out is that this climate controlled unit was a scam, not because it was not climate controlled, but because the owner would turn off the climate control at night and whenever else she thought she could get away with it. My grandparents were quite angry that they had paid so much to store all these antiques, furniture, and clothes in what amounted to a humid shed. Thankfully, the laissez faire capitalist ideal espoused by all our Republican “public servants” (and most Democratic ones too) of consumers regulating the market by refusing to patronize bad businesses worked like a charm in this case, since that storage unit is still in business today after forty years, even being featured in the local paper in one of their annual sections celebrating the oldest surviving businesses in the area. 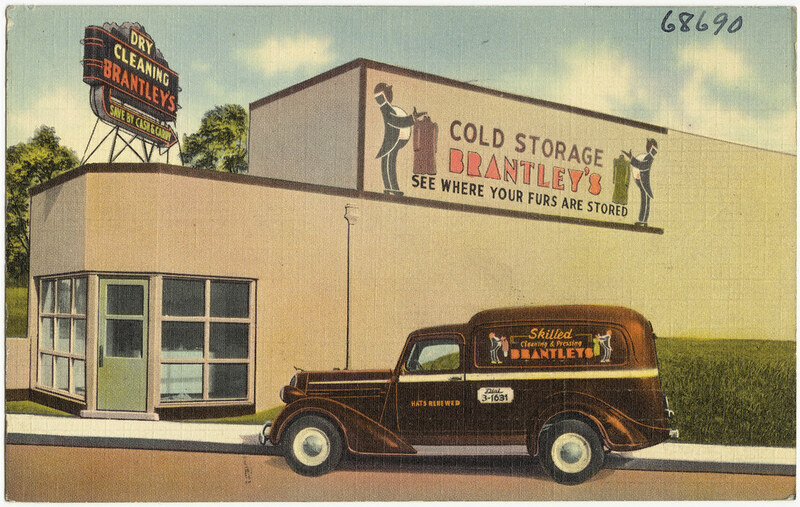 I imaging that commercial cold storage for furs, which has been common in Mississippi since at least the 1930’s, might be comparable although its certainly a much more specific commodity than a whole locker. The Boston Public Library’s Tichnor Brothers Postcard Collection has two postcards that depict a cold storage facility in Jackson. Seasonal cold storage for furs was, like your postcards show, associated with dry cleaners, I imagine particularly so in the South, with fewer people having fur coats and consequently fewer furriers. That storage is, as far as I understand it, basically refrigeration. Constructing and operating such a large, well-insulated refrigerated vault is expensive, making fur storage expensive, one of the reasons why (along with possible ethical concerns and changing fashions) that fur has fallen out of favor today. 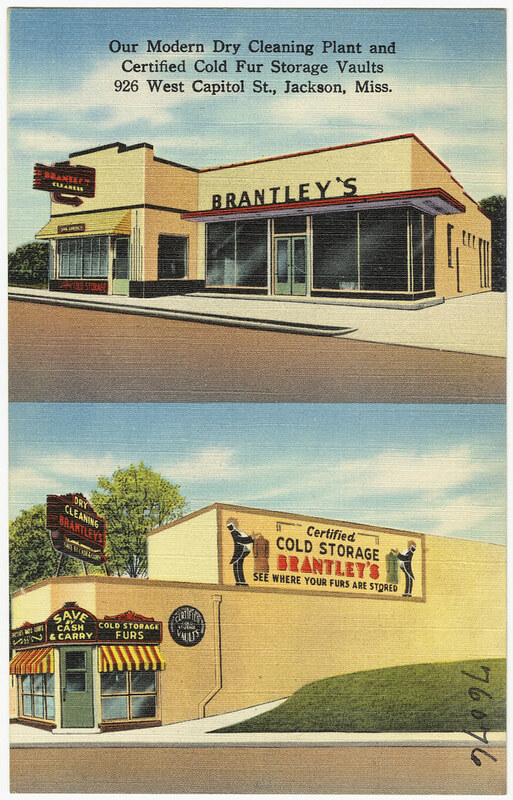 The middle Brantley’s Cleaners building is still extant on West Capitol, though its protruding section was lopped off when the street was widened. The remnant is unmistakable, retaining the same awning and side window arrangement. The building certainly looked better in the original version! I have found several references to cold storage plants in the New Deal references, but little else. I assume they were some type of food cold storage rather than fur storage. A late reply but the flu will do that. You are right, the cold storage plants you are referring to have nothing to do with furs; they had everything with keeping food fresh while getting it from farm to table. It was not a New Deal tenet to use public money to build cold storage buildings for the wealthy’s fur coats; that is more of a Trump policy. Building New Deal Liberalism: The Political Economy of Public Works, 1933-1956 states that Mobile, Alabama received a PWA grant to construct a cold storage facility on the docks to store fruits and vegetables. The book includes a photograph of the building, long since demolished (probably in the big urban renewal projects of the 1960s that replaced many of Mobile’s oldest downtown areas with interstates and parking lots).